I'm a long time member but not a regular poster, but hopefully that will change. I enjoy following DIY threads and now I have a few DIY projects going on which I would like to share. I'm afraid it's nothing that hasn't been done before but still if you're like me then you probably find it interesting to see how others tackle a certain task. So, I hope some will find this interesting. A while back I got two dagger blades from Paul Binns. They were quite cheap so I didn't expect them to be brilliant but even with that in mind I was a bit disappointed. However, now I have two dagger blades to play around with without worrying too much about mucking them up. 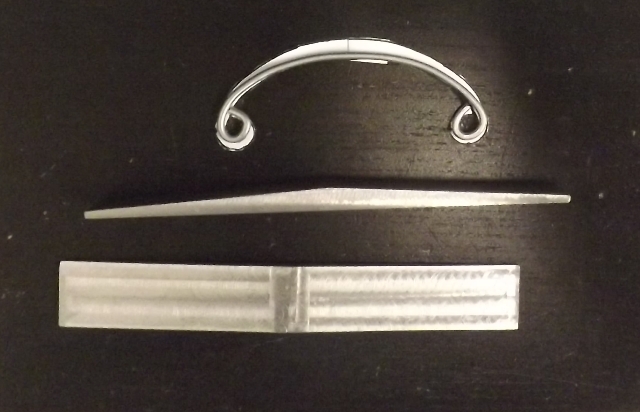 The blade in the top of the picture is OK-ish so I will leave it alone for now but the bottom one just looks very odd. The edges are wavy and the whole thing is very unevenly ground. As a first step I want to fix the profile of the blade. Eventually I want to make a hilt similar to the daggers found in The Royal Armouries and the Bayerisches Armeemuseum. 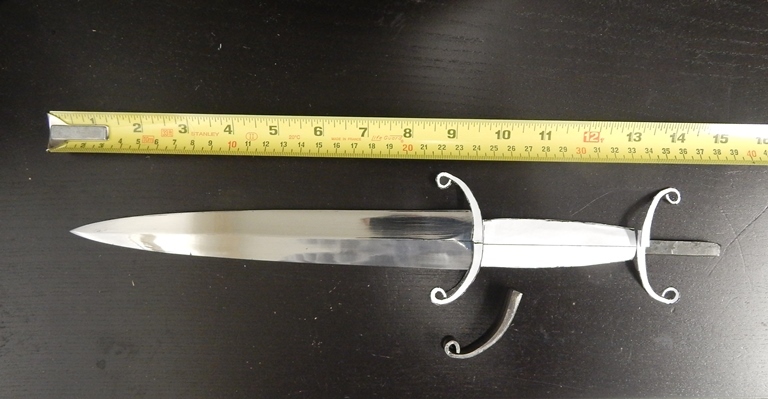 For those who aren't familiar with these daggers check out the Aunlaz dagger by Arms & Armor you can also find a review by Chad Arnow in the reviews section. Using a fine tipped permanent marker I drew the new profile on the blade and colored the sections which need to be ground off. Unfortunately not much to report as I didn't have time to play this past week until last night. I managed to get a bit of grinding done and I think I am happy with this blade shape. Of course now I have to regrind the bevels because removing all that material from the profile resulted in very thick edges. I'm not even sure if I will be able to do this without a belt grinder but I'll try anyway. Looks nice! In my experience heating (even if it´s only to dark-red) helps, otherwise metal could crack. Especially if you need to re-do the shape. Looking forward to see the final thing. Blade shape in the third post is really much better! Paper templates look good. I think you are on the right track for sure. Agreed! Love the final blade shape! With steel that thin, shaping the quillons with a torch should be quite easy. Thanks for the encouragement! I did most of the grinding on the bevels yesterday. It went surprisingly well once I figured out what I was doing. I regret not weighing the blade before all the grinding. I ended up removing quite a lot of material (and some of my fingertips :S), it would be interesting to see how much. I will clean up the blade and share some pics. Never enough time to play... but a little progress nevertheless. I have the blade finished to 800 grit. I might still grind the shoulders slightly but otherwise I'm quite happy with it. I have started making the guards. I found a piece of 20 by 6mm mild steel flat bar. I already had a pretty good idea on the length I need but just to be sure I cut a piece of wire and shaped to double check. Hi, I hope you all are having a great weekend. So, this is still happening, just not as fast as I would like it to but I made some progress.